Defunct amusement parks gates may be closed, but that doesn't mean that they don't hold a special place in many a park goer's heart. Amusement park enthusiasts, particularly enthusiasts who favor smaller, regional parks to the big mega-theme park chains, often long for the experience many now defunct parks offered. For decades, the Pavilion was one of the biggest draws for tourists and locals alike in Myrtle Beach, South Carolina. 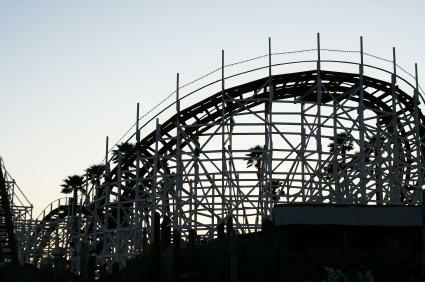 The park operated under a pay-per-ride model and hosted several family rides, water slides and two roller coasters: Hurricane and Arrow Dynamics. The park itself was reminiscent of a state fair or traveling carnival. In 2006, shortly before the park opened for its summer run, the owners shocked everyone by announcing it would be the Pavilion's last season. The park experienced record attendance in its so-called Farewell Season. Local residents expressed their sadness over the lost of their landmark in a number of different ways, from online petitions to songs, like Why Do You Want to Tear the Pavilion Down. Despite the protests, the park owners said they had no choice but to close the park as it was no longer financially viable. Two years later, Hard Rock Café swooped into Myrtle Beach and opened a new ride park, but it failed in the first year. They made a second stab at a park the following year, opening under a new name, but that venture failed as well. Opryland USA was open from 1972 to 1997. At its peak, it drew 2.5 million visitors, but several extenuating circumstances spelled disaster for the park. The biggest problem the park had was location. It was located on a relatively small, triangular patch of land, with the Cumberland River on one side, Briley Parkway on another and the Opryland hotel on the final side. The river frequently flooded the park, but the biggest problem was that these barriers stopped the park from being able to grow in size and build new attractions. Another problem was the weather. The park could only operate seasonally, and seasonal workers were scarce. After the park closed, some its biggest attractions were purchased by other amusement parks and given a new lease on life. Coney Island's ride park was designed to feel space age, but by the end of its run, it was destination number one for those seeking a nostalgic, theme park experience. Millions of visitors flocked to this iconic park every year, so it surprised everywhere when the owners announced in 2008 that Astroland would be closed. A new developer plans a $1.5 billion new park on the former grounds of Astroland. It's usually the small parks that go under, but the big boys are not immune to faltering park performance. Astroworld, located in Houston, was not initially a Six Flags park. It was built in 1962 by a local judge and operated by his family until Six Flags bought them out in 1975. Though the park had a few strong decades, by 2005, it just wasn't meeting expectations. Attendance was way down and parking was a constant issue. At the end of the 2005 season, the park was closed and demolished. Formerly Jazzland, Six Flags New Orleans was one of the area's most popular attractions. The park opened as Jazzland in 2000 and was bought out by Six Flags two years later. The park didn't close due to lack of popularity. Rather, it was another victim of Hurricane Katrina. The park is located in low lying East New Orleans. During the storm, the park's pipe system failed, so when Lake Pontchartrain overflowed its banks, the entire park was engulfed by approximately seven feet of brackish water. The water was not pumped out for months, causing extreme corrosive damage to all of the park's attractions. If you pine for the parks of yesteryear, you're not alone. Indulge your love for long lost parks on the Defunct Parks website.